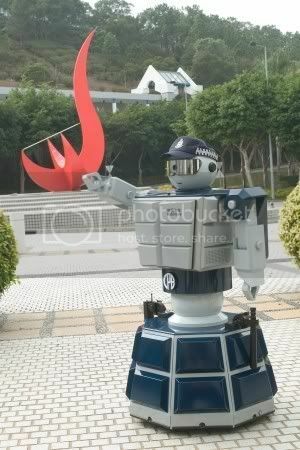 Meet Officers Mochine, Linux, and Circuit, leave it to Hong Kong to make crime fighting funny. 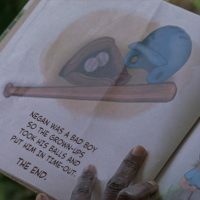 These knuckleheads are actually high-tech promotional tools created to teach children (ages 4-11) all about crime prevention. The star of the trio, Robotcop III (pictured left), takes center stage as the newest addition to the group and the first of the three to be designed and built locally. 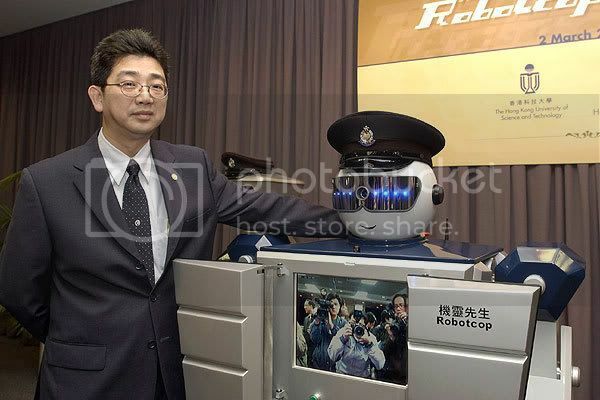 Robotcop III was designed by and for the Hong Kong people in part to showcase home-grown technology and help inspire the scientists of the future. That said, Robotcop III is designed to be more interactive then its American built predecessors. So just what’s under that HK$300,000 (US $38,500) hood? See for yourself (right), Robotcop’s most eye-catching feature is a concealed LCD monitor that allows for instant recording and displays via its optical camera. Robotcop can also navigate its way through a crowd thanks to infrared sensors and answer questions both Cantonese and English. Robotcop’s catch phrase: “Robot badges, we don’t need no stinking robot badges.